A mysterious forest populated by magical creatures, a tale told to a younger more innocent character; the idea of a fable for today demands the melding of iconic tropes to a contemporary sensibility. Eli Keel’s Fabled Fragments is popping up once a month all around town, chapter by chapter. Of course, this doesn’t make for fully satisfying storytelling; it is not meant to. 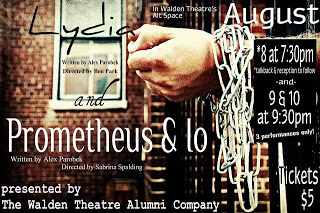 Each segment is presented as a tease of a full production scheduled for December at the Suspend Productions space on East Washington Street. So far the chapters have been presented in a studio or urban environments. 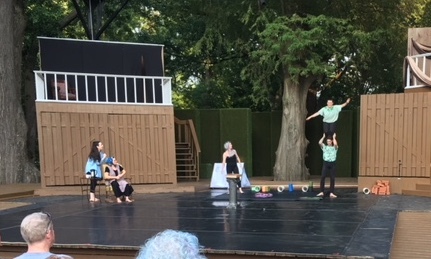 Chapter Three appeared on the Central Park stage before the August 3 performance of Louisville Ballet’s production of Roger Creel’s Tempest. The bucolic setting, with the magnificent three trees that frame the stage, is arguably the best location to date for the series, which imagines a forest landscape in which to play out the story. As established in previous installments, grad student Alex (Mollie Murk) is learning about a curious manuscript from the elderly Sophia (Katherine Martin). The narrative set-up is immediately undermined in a nicely subversive fashion by having the characters emerge from the membrane of a small tent as if to suggest that even the “natural” world of the narrator is not quite grounded in reality, as we understand it. I’m not sure if plot synopsis is meaningful here, as I missed the earlier chapters and am unaware of what might be crucial elements, but the acrobats (Courtney Markham, Morgan Lewis, Ryan Scott, and Asher Taylor-Dawson) portray characters in Sophia’s story that express their magical, otherworldly qualities through dance and acrobatics, including the titular wizard, played by Taylor-Dawson. Keel seems to be developing metaphors about the experience of women in our current culture through fantasy. It is appropriate since models of moral behavior have always been at the core of fairy tales and fables. This chapter starts off with scenes involving actors who move very little and then introduces acrobats who also act. For a time it feels as if we are watching actors not moving and acrobats who are acting, but the piece eventually merges the disciplines effectively by having Mollie Murk join in the choreography and find communion with the characters in the fable. It is a tantalizing shift that whets our appetite for more. 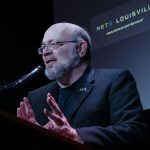 Keel has been involved in a sequential narrative before, as the title character in Theatre ’s Ludlow Quinn series written by Steven Moulds and Diana Grisanti, so I am confident he recognizes the challenge of shaping the individual segments into a cohesive narrative. The fable structure may serve him well in this regard, but we will see what December (and the months in between) will bring. Forthcoming chapters will occur at various locations that will be announced shortly before the first Friday of each month. Keep your ear to the ground if you wish to follow this path.